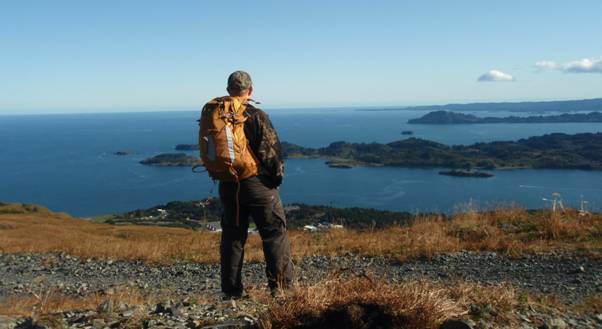 City, State, Country: Kodiak, Alaska, U. S.
I have been camping and backpacking for about 20 years. My introduction to the outdoors started with the Boy Scouts of America and has continued as an adult. I have hiked all over the Southeastern, Northeastern, and Northwestern United States. I am generally a lightweight hiker, but will carry extras to keep me comfortable. I currently reside on Kodiak Island in Alaska home of some of the worst weather and most beautiful scenery around. I look forward to putting gear through the paces here on the Emerald Isle. Color: Aspen Gold received, also available in Graphite Grey, and Green Apple. 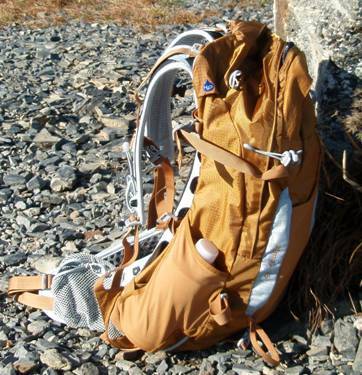 The Osprey Atmos 35 is a feature rich panel loader with a comfort range of 20 to 30 pounds (9 � 14 kg). The main storage compartment is quite large and includes a hydration reservoir sleeve with a fabric buckle clasp to hold the reservoir in place and ports on both sides for a hydration tube. There is a smaller mesh pocket with a key hook that is accessed by a smaller zipper close to the back of the frame. There is also another small compartment on the front top of the pack. True to the Osprey design there is a stretchy �shove it� pocket on the front of the pack. The pack also features two stretchy side pockets that can hold a regular size water bottle and two mesh hip belt pockets that can easily handle a camera, cell phones, or snacks. The pack also has several other cool features like �Stow on the Go� which allows the user to stow trekking poles through a bungee attachment on the left shoulder strap and a bungee attachment on left bottom corner of the pack. The pack also has �InsideOut� compression for the lower side straps which allows the user to either compress the bottom side of the pack over the elastic stretch side pockets or to reroute the straps under the elastic stretch side pockets. In addition, there are two tool attachments on the back of the pack and large glove friendly zipper pulls. Wow this is a neat little pack! I am impressed with the workmanship on the pack. Everything appears to be very well made of solid materials. I think the features on this pack are pretty interesting especially the trekking pole storage option. Here in Kodiak there are many mountains with little to no trails and plenty of places where I need both hands to get around alders, or to scramble up small rocky outcrops. I am interested to see if the poles catch on alders or restrict my movement while scrambling. I also like the �InsideOut� compression option. One of my pet peeves with other packs I have used is that the compression straps compress the side pockets rendering them useless. With the Osprey system, the compression straps can be put inside of the pocket allowing me to compress the pack and still have full usage of the side pockets. Very cool! I also like this intermediate pack size. Our test season is going to be fall to winter here in Kodiak for which this pack will be perfect. I anticipate being able to easily fit my ten essentials in this pack with plenty of layering and shelter options. I can also use a pack this size for fast and light summer overnight trips. Per Osprey�s sizing chart, I requested a medium size pack. I also went to REI and had a pack fitter measure my torso and fit me for this pack and he also concurred that I needed a medium. When the pack arrived, I placed some gear in the pack and tried it on. 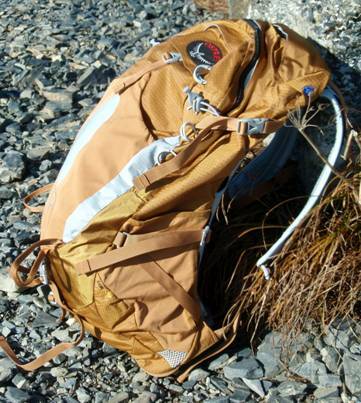 The pack fits very well and felt comfortable with the approximately 10 lbs (4.5 kg) I had in it. I received the Gold colored pack and to be honest that was the one color offered on the website that I didn't like. However, as I have been writing and inspecting the pack the color has grown on me and isn�t nearly as obnoxious as I thought it would be. It is actually quite nice and blends in well to the foliage we have here in Kodiak. There is one feature that I am not sure what the function is, and I was not able to find it in any Osprey literature. At the top of the main compartment there is a zipper that runs the along the seam that allows access to the area between the pack bag and frame. It provides access to this area but there doesn�t seem to be any reason to enter this part of the pack. I will continue to investigate this feature. The pack has performed well thus far in my testing. I have carried heavy loads all day with no issues, and the pack moved well while scrambling. I like the hip belt pockets. They provide easy access to my camera and snacks, but the mesh lacks rigidity making the pockets hard to open and close. The side storage pockets and the multiple pockets on the main body of the pack make organization easy. I have used the pack on five day trips over the past couple of months. My trips have ranged in duration from a couple hours to over eight hours and have taken place in Kodiak and Juneau, Alaska. 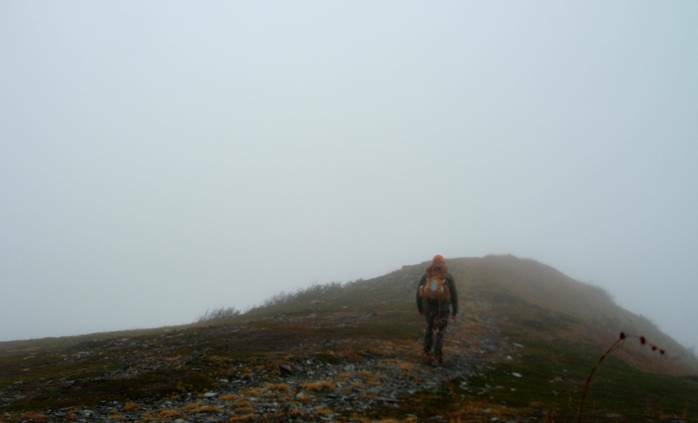 Elevation ranged from sea level to 2500 feet (760 meters) on Old Women�s in Kodiak, up to 3500 feet (1070 meters) on Mt. Jumbo in Juneau. Temperatures ranged from around 50 F to 25 F (10 C to -4 C). Winds experienced ranged from slight to blowing in excess of 30 mph (48 kph) which is typical for late fall/winter here in Alaska. Trails here in Alaska are for the most part non existent and what exists is very rough with little to no switchbacks and serious vertical gain. Fall through Spring is the wet season here in Kodiak, and the pack has been used in both rain and snow. Let me start by saying thanks to all those who emailed me concerning the extra zipper allowing access to the mesh area between the back panel and the pack frame. It allows the user the option of storing a hydration bladder there instead of inside of the pack. Once again thanks, it is good to know that my reports are actually being read! I evaluated the pack on three characteristics � fit, durability, and usefulness over the last couple of months. The fit of the pack has been great so far. I wasn�t sure how the perforated shoulder straps and hip belt would perform while the pack was stuffed full, but they did a good job of distributing the weighted pack and provided plenty of cushioning. The most impressive feature I think though is the mesh backpanel of the pack. 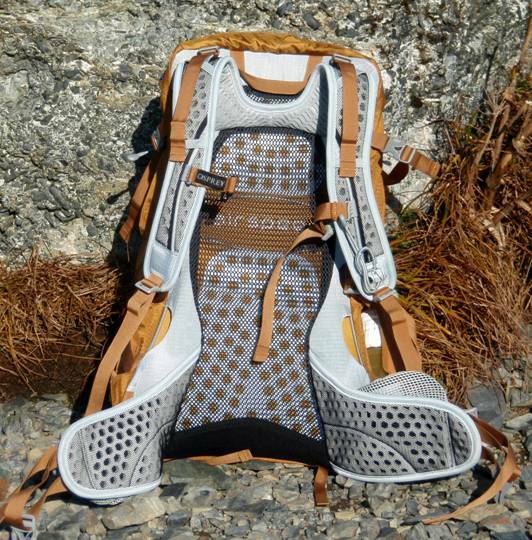 It is the best ventilated pack that I have ever used. While hiking in our stiff fall winds, I could feel the wind flowing between the pack and the back of my shirt. Awesome! I did some scrambling on Mt. 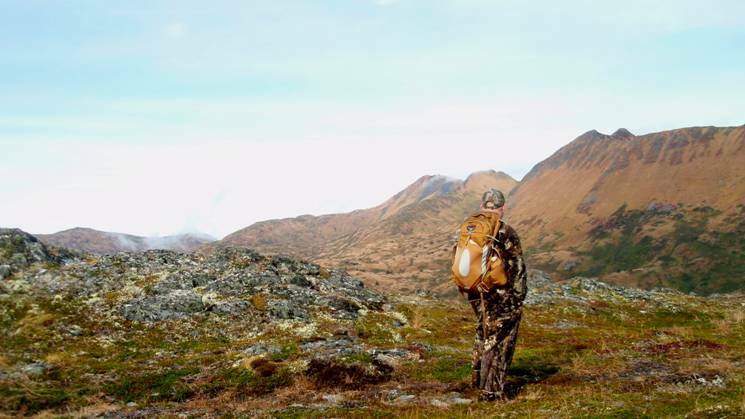 Jumbo out of Juneau and the pack didn�t restrict my freedom in any way while moving up the mountain. There have been no durability issues with the pack thus far. I don�t intentionally try to do anything to damage the pack, but I have been known to be a klutz from time to time. While descending Mt. Jumbo via headlamp on a damp trail, I managed to fall multiple times on the way down where the pack cushioned my falls. I can gladly report that I only suffered some bruises � physically and to my ego! However, other than some dirt on the pack it still looked new. I was concerned that the mesh pockets might snag on things and rip easily, but thus far it has not been a problem. I was also concerned with the durability of the perforated shoulder straps and hip belt, but have had no issues. The third characteristic that I evaluated the pack on was how useful it is. The main compartment swallows gear easily. I was able to fit my shell top and bottoms, a large fleece, and assorted miscellaneous gear in this compartment. I used the smaller compartment to store gloves, my first aid kit, and food. I used the shove-it pocket to store anything that I needed quickly. This is usually where my fleece ends up after starting out in the main compartment. The side pockets were another great feature. The pocket has access at the top and the side closest to the user. 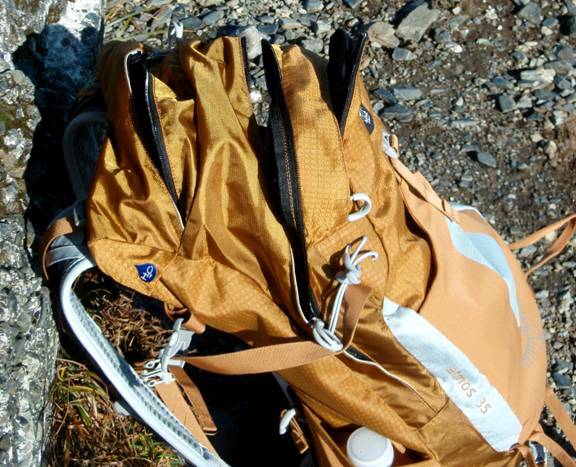 The opening on the side closest to the hiker is designed so that the he can reach his water and replace it without taking the pack off. I have used another Osprey pack with this feature but because of the shape of the pack I couldn�t return my water bottle to the pocket. However, I can replace my water bottle on this pack and I like this feature! The weather has been chilly so I have been using water bottles instead of a hydration bladder, and now that the bears have started to hibernate I tend to hike alone. I like not having to take off my pack to get a drink. Continuing on the theme of the side pockets, I really like the �InsideOut� compression strap feature. I have been able to cinch the pack tightly when I did not need maximum capacity, but didn�t have to cinch my water bottles in place too! I mentioned the hip belt pockets earlier. They are quite large and can easily hold an average sized digital camera, two flip style cell phones or several food bars. Nothing is perfect though. The hip belt pockets are hard to zip because the mesh is flimsy, a minor annoyance at this point. I have not had the opportunity to try out the stow-and-go feature to store trekking poles yet, but now that snow is on the ground I will be using trekking poles as I snowshoe and it should allow me to have the opportunity to test this feature. The pack has continued to perform well over the past couple months. It handles heavy loads with ease and remains comfortable to carry even in challenging conditions. The only new thing I learned is the side pockets aren�t as easy to use with a standard liter bottle. I can easily fit a more slender liter sized Powerade bottle in the pocket without removing the pack but cannot put my standard liter sized Nalgene bottle away without taking the pack off. I used the pack on three more day hikes over the past couple months. 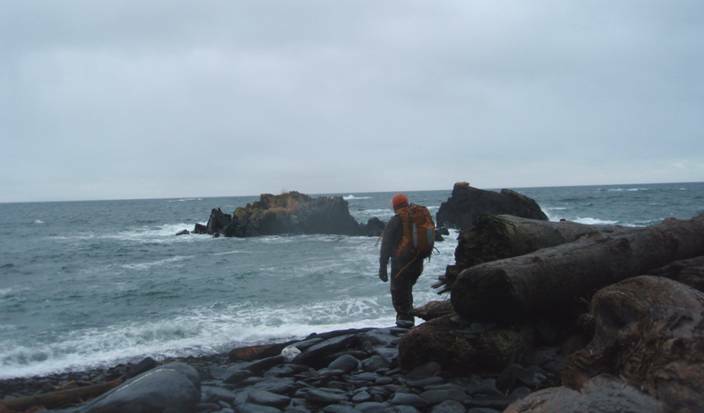 The first was a loop hike to Termination Point; the other two were at Fort Abercrombie here in Kodiak. Elevation change has been minimal with no more than 500 feet (152 m) of gain over the course of the hikes. Temperatures have ranged from 40 F to 20 F (4 C to -7 C) and my hikes have consisted of schlepping through a driving rain with little to no snow. I continue to be pleased with the fit and comfort of this pack. I like that I can shove it full of gear or pack it with the bare minimums and it carries the same. The mesh backpanel is great. The frame and mesh panel force a gap where I won�t be poked in the back when I sloppily throw my gear into the pack. The shoulder straps and hip belt have remained comfortable and feel like they are molding to my body shape. Durability has also continued to be good. There is a little bit of abrasion damage to the bottom of the pack where the hip belt meets the body of the pack. It is very minor and cosmetic only. The scratches probably resulted from me setting the pack down on rough surfaces like the rocky beaches on the way to Termination Point or at Fort Abercrombie versus the falls mentioned previously. I have also been pleased with the elasticity of the shove-it pocket. I am able to easily shove gear into this pocket and the elasticity of the pocket holds the gear solidly in place. I would caution on putting anything that has sharp edges in this pocket. I used the pocket to carry a pair of traction devices and I could see the points on the traction devices pushing into the outer material, but they never poked through. I have continued to enjoy the great organizational features mentioned in the Field Report. I still am a bit frustrated with the floppy zippers on the hip belt pockets and I learned that not all water bottles are created equally. During my field report, I was using a standard sized one liter Powerade bottle as my drink bottle of choice. I was able to easily remove this type of bottle from the side pockets on the pack. The bottles are fairly tall and skinny. However, during the last couple of months, I switched to standard wide mouth one liter Nalgene bottles and experienced vastly different results. I was able to remove the bottles from the side pockets, but could not get them back into the pockets. I have examined this from various angles and it seems like the larger diameter and shorter Nalgene bottles don�t fit into the pocket as well as a skinner bottle. Not a huge issue, I just need to make sure I grab skinnier bottles or use a hydration system if I am going to be hiking solo. Overall this is a great day pack for all day adventures. This concludes my Long Term Report. Thanks to Backpackgeartest.org and Osprey Packs for allowing me to participate in this test.